So here is the latest bunch of outfits for you! The weather hasn’t been very predictable the past few days, so this week has been a mixed bag of clothes. 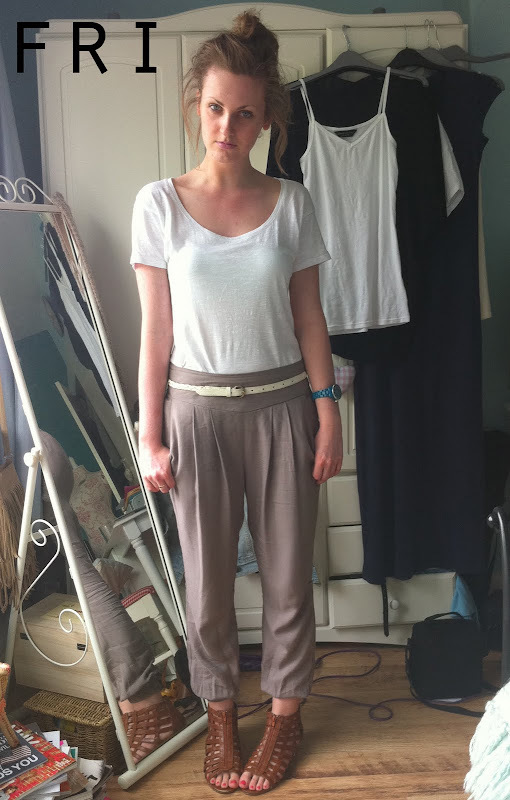 I have gone through wardrobe hell, toying between full length trousers and little dresses. Come on sunshine, sort it out! 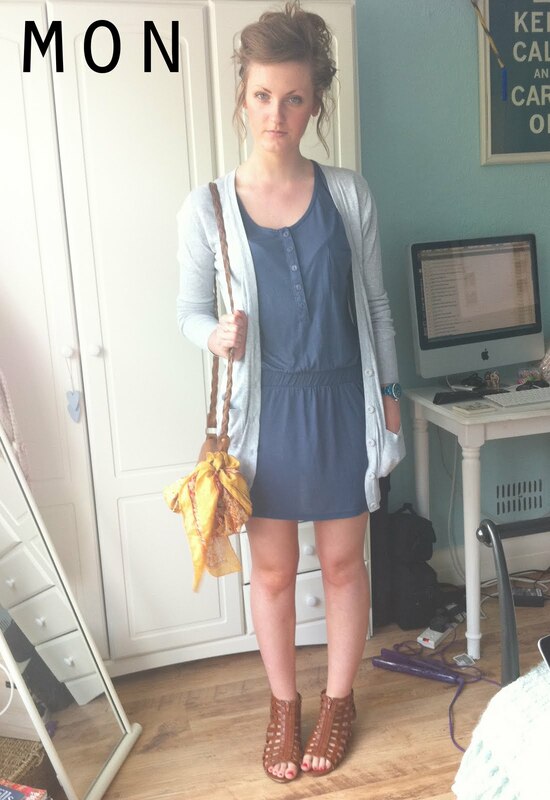 Mon: Cardigan – New Look, Dress – Warehouse, Bag – Primark, Scarf (tied to bag) – Charity Shop, Sandals – Dorothy Perkins. 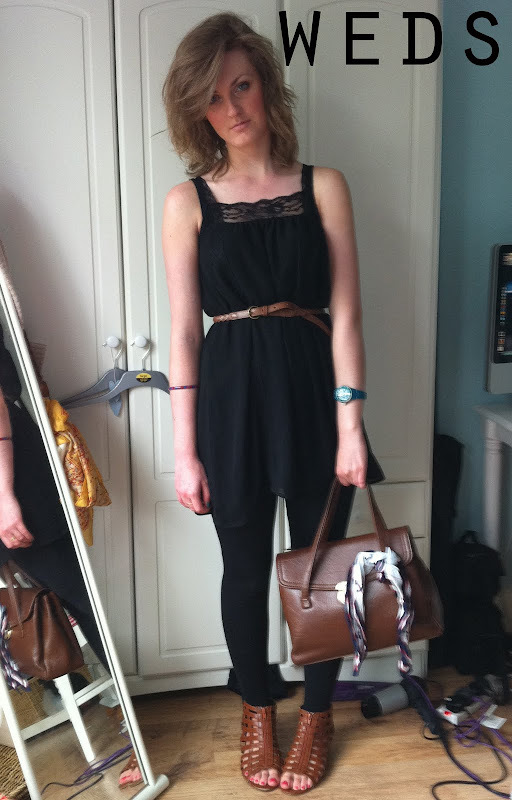 Weds: Dress – Topshop, Leggings – Miss Selfridge, Belt – Primark, Sandals – Dorothy Perkins, Bag – Charity Shop, Scarf (tied to bag) Urban Outfitters. Fri: Tshirt – Dorothy Perkins, Trousers – Dorothy Perkins, Belt – Primark, Sandals – Dorothy Perkins. Sat: Body – George @ ASDA, Harem Trousers – F&F @ Tesco, Platforms – Topshop, Bag – Primark, Scarf (tied to bag) – Charity Shop. Sun: Vintage Dress – eBay, Cardigan – Primark, Leggings – Topshop, Sandals – Dorothy Perkins. There you go everyone! Hope you like this week’s installment. "VOTE FOR ME! 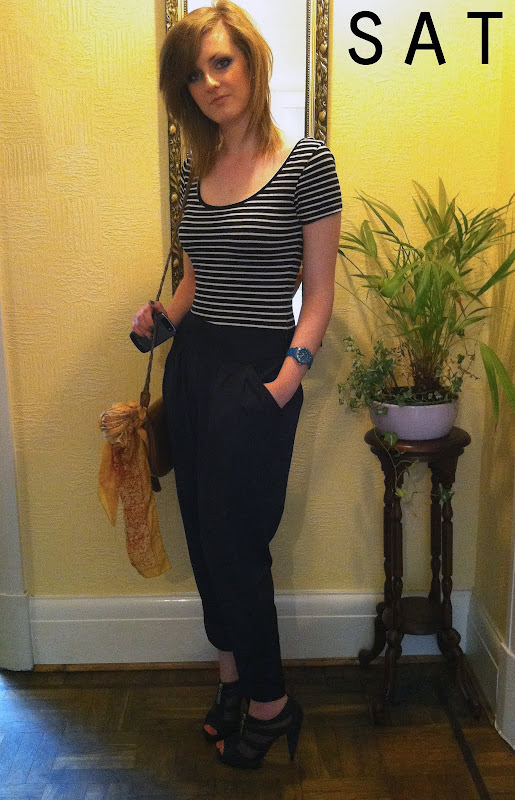 BRITISH STYLE BLOGGERS – BLOG OF THE MONTH"
The weather has been rather confusing hasn't it!? I love Monday's dress, but Friday's outfit has gotta be my fave – those trousers are just to die for! I know I raved about them when you bought them, but they look even more gorgeous on! Looking forward to this week's installment!